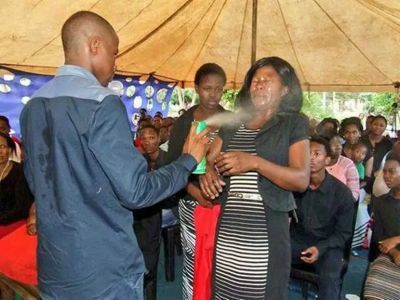 Prophet Lethebo Rabalago sprays a congregant with insecticide (PHOTO: Dispatch Live). Originally published in For SA. Following news reports of a pastor who sprays his congregants with insecticide, claiming that it will heal them of their sicknesses, a group of 99 major denominations and churches in South Africa have issued a Joint Statement repudiating the actions of this self-styled “Prophet of Doom”. Freedom of Religion South Africa (FOR SA) delivered the Joint Statement to the CRL Rights Commission, which is calling for the broad-scale regulation of religion in SA, on Tuesday November 22 2016. The statement reads: “We, the undersigned churches and denominations, repudiate in the strongest possible terms both the claims and the unlawful actions of self-styled Prophet Lethebo Rabalago of the Mount Zion General Assembly in Limpopo. “While we believe that the Bible teaches that the Lord Jesus Christ healed people of all manner of diseases and ailments during His earthly ministry, He always did so in a way that protected their dignity as human beings made in the image of God. “On no occasion did He act in a way that caused physical harm to people or further endangered their health. As such, these reported actions are completely contrary to both biblical teaching and practice. “Furthermore, spraying a known toxic liquid over another person, and thereby causing them physical harm, is both unlawful and illegal. We therefore call upon the Government to exercise its powers to ensure that this action is reported to the appropriate law enforcement authorities, to ensure that its perpetrator is prosecuted to the full extent of the law. “We also call upon the victims of these (and similar) acts to withdraw their support from those whose practices and teachings are in no way a reflection of true biblical Christianity.